The Windham schools are back in session starting today! We want to wish all the students, faculty, and staff a successful 2011-12 school year! Sallie's class is supposed to be raising chicks as a science project, but although Argus, the large, green, scaly creature that hatches from her egg, causes all sorts of trouble she worries about him when he disappears. 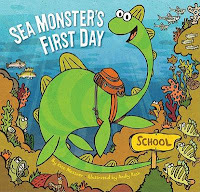 A young sea monster experiences his first day of school and, after a rocky start, he makes friends and has fun. 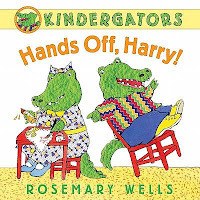 Harry has trouble keeping his hands off his classmates until Tina thinks of the perfect piece of gym equipment to teach him about personal space. The Alcott home, in Concord, MA, is the setting for the book Little Women [F ALC]. Emily Dickinson's home is in Amherst, MA. Dickinson spent almost her whole life in the house. Some of Dickinson's poems can be found in New Poems of Emily Dickinson [811 DIC]. Mark Twain had a beautiful home in Hartford, CT. We have the latest edition of the Autobiography of Mark Twain edited by Harriet Elinor Smith [B TWA]. Within shouting distance of Twain's home was the home of Harriet Beecher Stowe, author of the anti-slavery book Uncle Tom's Cabin , found in Three Novels [F STO]. Stowe was actually living in Maine when she started writing Uncle Tom's Cabin, the home in Brunswick is not open to the public, but you can read about it here. 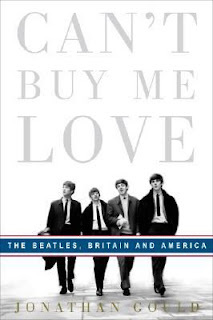 August 29 is an important date in Beatles history. (You do remember the Beatles, don't you?) In 1966 the Beatles performed at Candlestick Park in San Francisco, CA. It was to be their last public concert as The Beatles. And lots of musical CDs [CD ROCK BEA]! Ekphrasis is a mouthful of a word, but, according to the Merriam-Webster online dictionary, it has a simple definition: "a literary description of or commentary on a visual work of art." Here's mine, "art about art," which implies I disagree slightly with Merriam-Webster! I believe that ekphrastic poems are ones written about any work of art, be it a painting, sculpture, a piece of music, or, I suppose, another poem. It just seems that more poems are written about visual art than any other type of art. Marilyn Chandler McEntyre writes books of ekphrastic poems on the works of several artists. Today I'd like to recommend McEntyre's The Color of Light: Poems on Van Gogh's Late Paintings [811.54 MCE]. In it, she has 20 poems on 19 paintings by Van Gogh, including his famous "The Starry Night." The Color of Light is a small format book, 6 1/2" by 7 1/2". 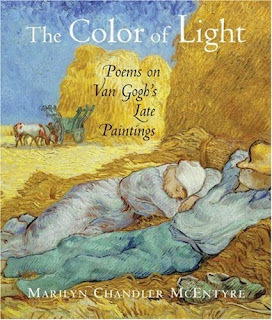 Each poem is given a title relating to the painting, the date of the painting, and is accompanied by a color reproduction of the art. A nicely designed package! I was enchanted by this poem inspired by "Olive Trees With Yellow Sky and Sun." monuments to what may be borne. brings forth. Taste and see. "Couple Walking between Rows of Trees" is also evocative and not to be missed. 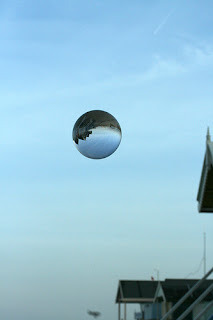 Also not to be missed is this Friday's Round-Up of poetry-related posts. The Round-Up is being hosted by Irene Latham. For the next few weeks we're doing some painting and rearranging in our behind-the-scenes work space and it requires clearing out our desks and moving into another area of the library. It also means that our work flow will be a little out of sync and I'll probably be writing shorter and simpler posts until things get back to normal. is a celebration of life – championing those who have beat breast cancer, supporting loved ones fighting it, and remembering those who have succumbed to it. 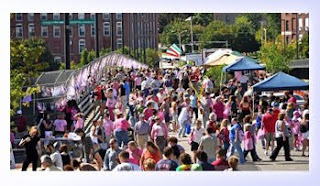 The celebration is taking place on Saturday, September 10, in Manchester, and it is also, as its name implies, a display of bras spanning the Merrimack River. If you purchase a ticket before tomorrow, you'll get a restaurant certificate equal to the purchase price, which means it won't cost you to attend, and, you get an excuse to eat out! Sort-of-related reading: The Ruby Slippers, Madonna's Bra, and Einstein's Brain: the Locations of America's Pop Culture Artifacts by Chris Epting [306 EPT]. Yesterday, the Eastern part of the United States experienced an earthquake. It was centered in Virginia and I was told it was felt in Nashua! Did any of you feel the ground shake at 1:51 PM? It is rare for a large earthquake to occur in the East, but it does happen. For information about earthquakes in the East, click here. We have plenty of books on earthquakes in the children's room, including a brand-new (©2011) book called Anatomy of an Earthquake by René C. Rebman [J 551.22 REB]. Check it out! Playing For Change Day 2011: Join in! On September 17, in locations around the world, people will be gathering to make music. Why not think about having a drum circle that day? Or a sing-along? Or a good old-fashioned jam session with your friends. It doesn't have to be a musical extravaganza, just a sharing of musical good times. If you've never come across Playing for Change, come to the library and borrow our DVD/CD of Playing for Change: Songs around the World [CD PLA]. For information about the September 17 activities, click here, and for information about the Playing for Change Foundation click here. At the end of June I started a personal blog called Kids of the Homefront Army: Poems of World War II America. 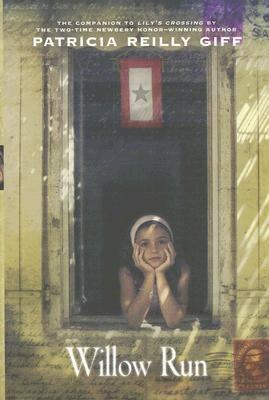 About ten years ago I started a project of documenting the lives of children who lived during the war years in America. Dozens of people filled out questionnaires or corresponded with me about their experiences. Many shared information through email, and even some sent me WW II memorabilia. 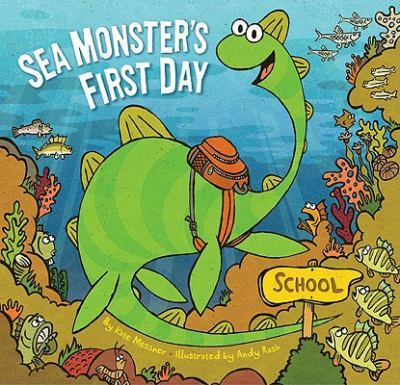 Over several years the project evolved from a strictly informational nonfiction title to a book of poetry for kids (grades 5 and up). After several marketing tries, I decided to publish the book serially, online. So, for ten months of so, a poem is posted on Mondays and Fridays. Wherever possible, I've tried to illustrate each poem with photos and other ephemera. 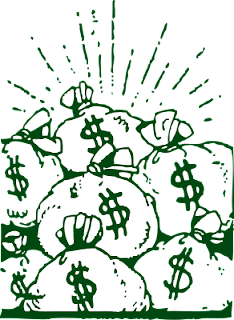 If you take a peek and like what you read, consider subscribing to have installments sent to your inbox. And, by all means, share the posts with your friends and your kids. Also, please visit the Facebook page where you can follow the posts and find additional information and links. In World War II America everyone participated in the war in one way or another. Everyone. Many of the experiences were shared, others were particularly unique to the individual. I found that poetry was the best way to blend fact and emotion in a succinct way. 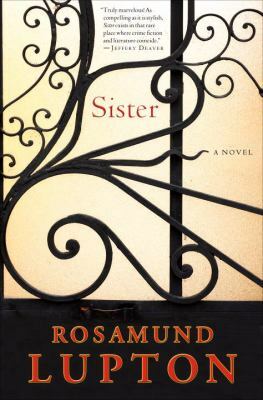 As one woman risks everything to uncover the truth about her sister's last moments, this debut novel with a knockout twist shows that nothing is as durable--and as exceptional--as the bond between sisters. 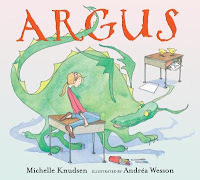 Lucy Hull, a young children's librarian in Hannibal, Missouri, finds herself both a kidnapper and kidnapped when her favorite patron, ten-year-old Ian Drake, runs away from home. The odd pair embarks on a crazy road trip from Missouri to Vermont, with ferrets, an inconvenient boyfriend, and upsetting family history thrown in their path. But, is it just Ian who is running away? Who is the man who seems to be on their tail? And should Lucy be trying to save a boy from his own parents? 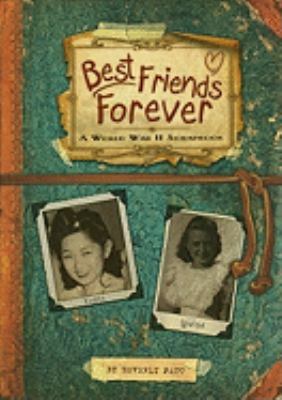 Blending White's correspondence with the likes of Ursula Nordstrom, James Thurber, and Harold Ross, the E. B. White papers at Cornell, and the archives of HarperCollins and the New Yorker into his own elegant narrative, Sims brings to life the shy boy whose animal stories--real and imaginery--made him famous around the world. 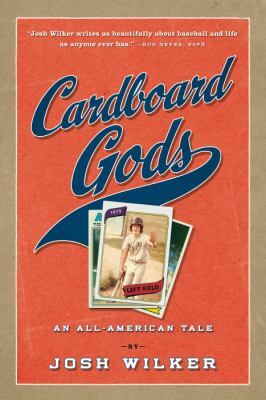 The author describes his life and reflects upon the baseball players of his youth, based on the baseball cards he collected between 1974 and 1981, and discusses his lifelong fandom of the game. Twice this week I've posted about postcards. So, I figured I'd finish off the week with yet another! 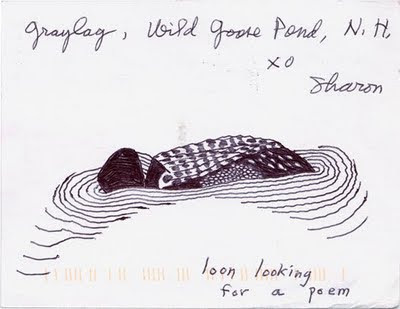 This summer, the website of the Academy of American Poets, poets.org, has solicited postcards from poets. The missives are archived here. Visit Karen Edmisten for this week's Poetry Friday Round-Up. Next week I'm taking a long-anticipated vacation--maybe I'll send you a postcard! See you back here on the 22nd. The Invention of Hugo Cabret: A Novel in Words and Pictures, by Brian Selznick [J SEL], won the Caldecott Medal in 2008 as the "most distinguished American picture book for children." NPR's All Things Considered had a segment on the book that might be of interest. Fans of the Hugo Cabret will be happy to know that Brian Selznick has a new book coming out on September 13--Wonderstruck. Not long ago, The New York Times had a piece titled "Favorite Snacks of the Great Scribblers," by Wendy MacNaughton. MacNaughton, a writer and illustrator, wrote about the snacks that famous writers choose to nosh on while writing. MacNaughton herself nibbles on "a small bowl of garlic croutons." Most of us like to have some food at hand while working, studying, watching tv, playing cards, etc. Most of us could probably benefit by snacking a little more consciously! By that I mean eating foods that are not high in sugars and fats! 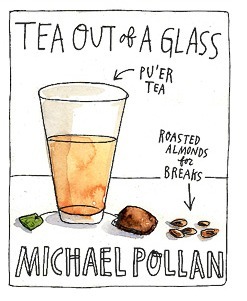 Michael Pollan, as can be seen from the illustration, does not go for potato chips and cola while he works. He practices what he preaches in books such as In Defense of Food: An Eater's Manifesto [613 POL, also in AB/CD] and Food Rules: An Eater's Manual [613.2 POL, also available in ebook form for Nesmith card holders from NHDB]. Yesterday's post referenced a commentary by Charles Simic on "The Lost Art of Postcard Writing." Today I'd like to make you aware of the collection of postcards that the Nesmith Library owns. 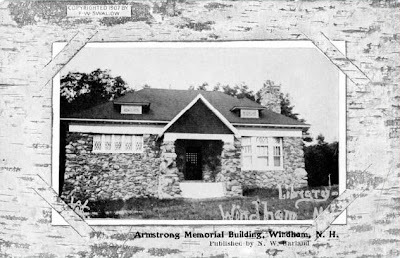 The Arthur Wheat Postcard Collection contains various scenes of Windham taken about 100 years ago during the heyday of postcard production. The postcard of the library, below, is one of several library scenes. It dates from 1907. No information is available on Arthur Wheat, the man who donated the postcards to us, so, if you know his history, we'd appreciate hearing from you. The collection was scanned and captioned by Sylvie Brikiatis as part of her coursework for a Masters in Library and Information Science at Southern Connecticut State University. The New York Review of Books blog recently posted a commentary by poet Charles Simic on "The Lost Art of Postcard Writing." Simic bemoaned that fact that he no longer regularly receives postcards from traveling friends. He recently, though, got a postcard from a visitor to Mongolia. This piece of snail mail, I thought, left at the reception desk of a hotel, dropped in a mailbox, or taken to the local post office, made its unknown and most likely arduous journey by truck, train, camel, donkey--or whatever it was--and finally by plane to where I live. If you have yet to take a vacation this summer, why not send us a postcard! We'd love to hear from you. Address it to Nesmith Library, 8 Fellows Rd., Windham, NH 03087. In my experience, people in the habit of sending cards could be divided into those who go for the conventional images of famous places and those who delight in sending images whose bad taste guarantees a shock or a laugh. I understand that impulse. When you’re in Rome, everyone back home expects a postcard of the Coliseum or the ceiling of the Sistine Chapel: send them instead one of a neighborhood pizzeria with five small tables, three potted plants and the elderly owner and his wife wiping their hands on their aprons and smiling broadly. We don't mind a laugh, but be careful about shocking us! I lately realized that we didn't have a book of Amy Lowell's poetry in our collection. Surely an oversight since Lowell is a marvelous example of the New England poet with her poems such as "Lilacs" and "Monadnock in Early Spring," and I've featured her several times on Poetry Friday! I've corrected the oversight and purchased Amy Lowell: Selected Poems for our collection [821 LOW]. On this sunshiny summer's day I've decided to go with a joyous Lowell poem called "Balls." Check out the Poetry Friday Round-Up at A Year of Literacy Coaching. Have a great weekend! Know what Saturday is? 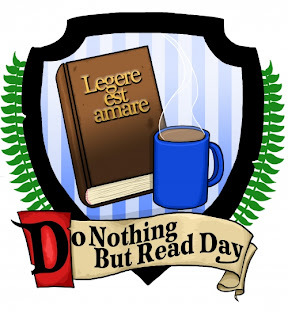 Do Nothing But Read Day! What a delightful holiday to celebrate! Come down to the Library before Saturday and stock up on reading material. You know we have books, but did you also know we have magazines? Browse the shelves and then go home with an armful of magazines. Do Nothing But Read Day crest by Brandon Werner. In Madison, Wisconsin an organization has been set up to share books within the community. It's called Little Free Library, and it appears to have taken off with communities, such as the city of Chicago, now participating. Doesn't this seem like a great project for Windham? 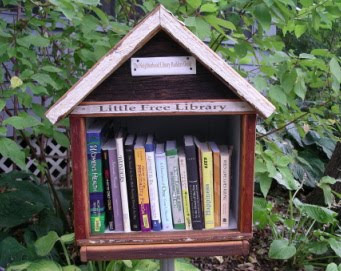 Imagine a Little Free Library at the Town Beach or at Griffin Park! Your Little Free Library can be for adults, children, or both. The important thing is to offer a positive selection of good reading that is appropriate to your community. Your collection can be about history, heroes, art; even "how-to" books and classics. What a meaningful and rewarding project for scouts or other youth group! And, it's nice to know that a book is being read rather than seeing it being thrown away! It's an all-around great idea! Photo courtesy Little Free Library. 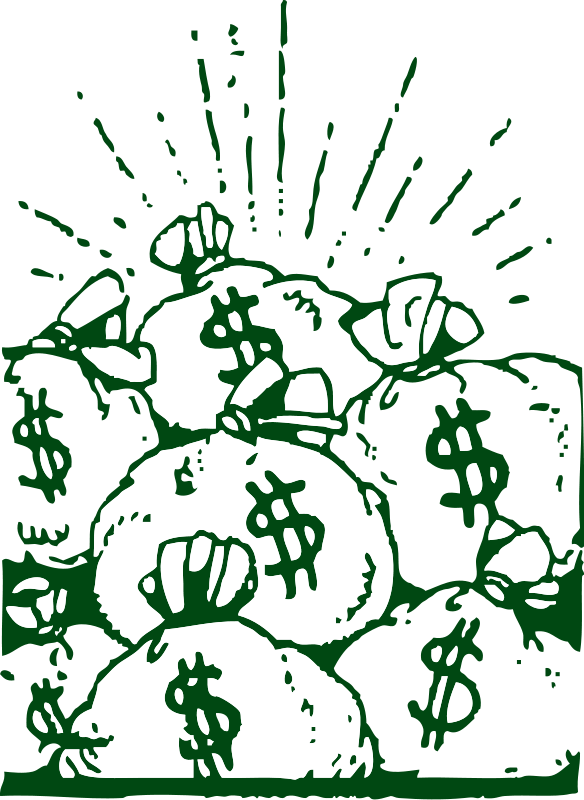 For their Top Ten Tax Charts, click here. If you've ever been down to Boston to see the Celtics play, you've probably have walked by a street musician who uses nothing but plastic buckets to make music. These simple plastic buckets are awesome percussion instruments when played by talented individuals. To see an example of street music (and movement), look for the DVD Stomp Out Loud [DVD 785.68 STO]. It's fabulous, and dare I say, inspirational? If you're inspired to create you own musical instruments, a new book on our shelves is Making Musical Instruments with Kids: 67 Easy Projects for Adults Working with Children by Bart Hopkin [784.1923 HOP]. There are instructions for making bucket drums, as well as many other instruments--some quite surprising. The book comes with a CD so that you can hear what the instrument is supposed to sound like, and it also includes tuning how-tos. 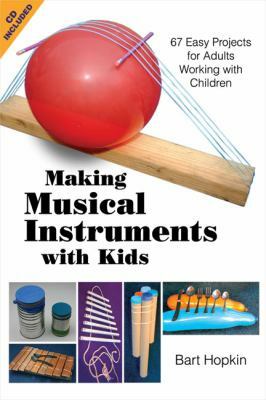 This book is not just for kids--some of the instruments are fairly sophisticated, like the 12-string fishing line zither.